When you log into the CMS you are taken to the dashboard. 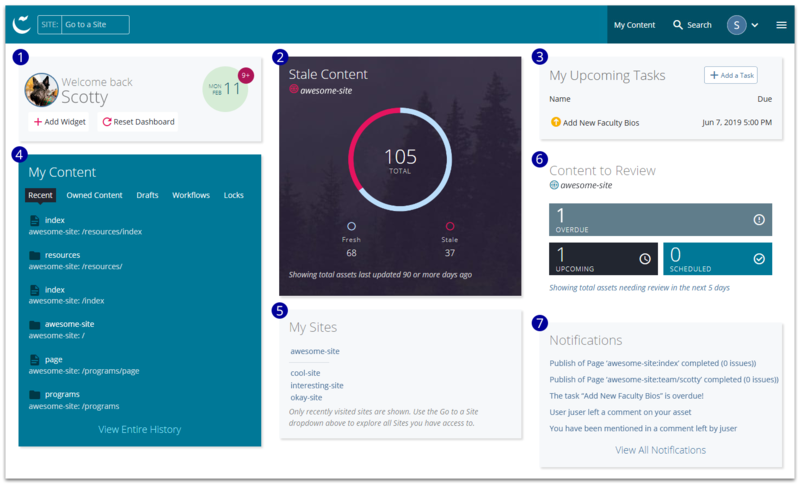 Consider the dashboard to be your home area in the CMS; it provides an overview of your recent actions, notifications, and site content. The dashboard is comprised of widgets (tools) with a configurable layout so you may add, remove and rearrange the widgets to best suit your needs. The CMS uses a responsive design (i.e., it is mobile-friendly) so the interface will change depending on factors such as display size and device type. If your interface differs from what is shown, click around to discover where things might be for you! Note: The main toolbar located at the top the dashboard is covered in the Site Management interface. Add or reset widgets on your dashboard using the Welcome widget. Assets (pages, folders, files) that have not been updated within a set time period. You set the time period in which content is considered stale. Tasks allow you to create and organize a CMS to-do list. Quickly access your recently-updated assets and saved drafts. Sites you've recently visited; click any of them to switch into the site. Assets with upcoming review dates; review dates can be configured for each asset. Your most recent notifications such as publish reports and user mentions. As some widgets are site-specific (such as Stale Content and Content to Review), you may add multiples of the same widget and specify a different site for each. Additional widgets not covered here are available to add using the Welcome widget, however not all are fully functional. Refer to the Dashboard instructions for configuring widgets.